That’s right! With every Eglu order this week we will throw in a 1 metre run extension for FREE! Think of it as a free upgrade to the best room in a five star hotel. 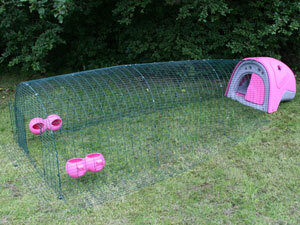 This offer applies to the standard Eglu Classic with 2m run and the Rabbit Eglu with 2m run. Just add it to your shopping basket, enter the promo code below and a free Run Extension Kit A will be added automatically. This is a great offer, saving you £49.00! So what are you waiting for? Buy an Eglu and get a free Run Extension!